January 23 is a great day for baking a pie. Chose sweet pie or pie with meat to celebrate National Pie Day. National Pie Day was celebrated for the fist time in 1986 by the American Pie Council. The celebration was held to commemorate Crisco's 75th anniversary. The first pies appeared around 9500 BC. It is believed that the Romans and Greeks made the first pies in the history. First these were meat pies with rich and tasty filling. Later people started adding fish, chicken, mixed vegetables and spices to filling that made pies better and tastier. Sweet pies appeared only in late 1800s. 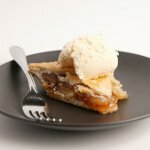 There are different kinds of pies, served in the U.S. Pie à la mode is a sweet pie with a scoop of ice cream. Angel pie is a meringue crust filled with whipped cream. It also may contain fruit layer or filling. Apple pie is considered as American pastry, but you have to forget that. Apple pie with sugar, cinnamon and nutmeg was an English pastry speciality. No matter what kind of pie you chose, bake it in honor of National Pie Day.